A Porcelain inlay restoration is a custom made filling made of porcelain (although it can also be made of composite material or gold). Porcelain inlays are popular because they resemble your natural tooth. 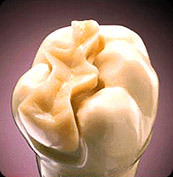 A porcelain inlay can be mde in 1 visit, and is permanently cemented into the tooth by your dentist. A porcelain inlay can be completed in 1 visit using a high preceision computer to scan, design, and mill out your inlay from a block of porcelain.